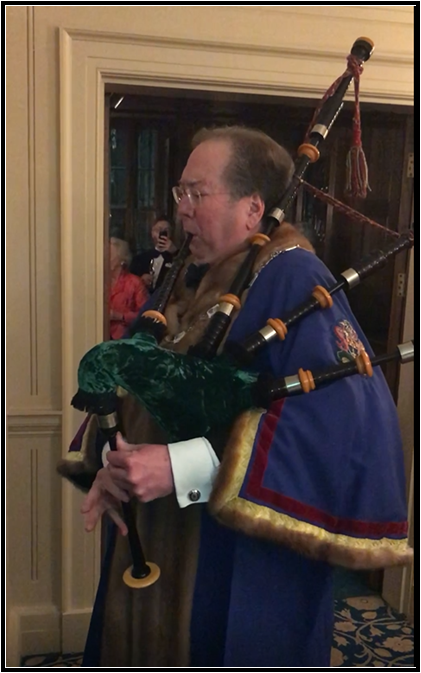 The Worshipful Company of World Traders’ Members’ Dinner fell on Burns’ Night, so I felt obliged to herd everyone in to dinner with some piping. The Beadle did forewarn the members and guest (Bill Emmott) to enter swiftly or the Master would “play the piper”. Wardens, My Lords, Distinguished Guest, fellow World Traders. What a delight to welcome you to this Members’ Dinner, our annual chance to get away from it all and kick our feet up informally in a Michelin Star Livery Hall in black tie. My apologies that it being Burn’s night I felt obliged to have at least some Burns’ Night cuisine at the start. I hope we didn’t insult our esteemed chef, and our sincere thanks go to the Innholders for sharing their chef. As Jeeves was wont to say about Anatole, “God’s gift to the gastric juices”, perhaps we should poach him. They say a gentleman is a man who can play the bagpipes, but doesn’t. I wonder if a gentleman is a Livery Master who can make a speech, but doesn’t. Dream on. May I start with thanks to Mavis Gold, Charles Lucas-Clements, and Eric Stobart for their remarks, and a special thanks to Norman Rose for some extra-special Scottish music well-played. A quarter-way into my term, I would like to thank all of you for your immense support. We have had three large set-piece events. Our King’s College Archives tour is hard to surpass, handling DNA Photo 51 and the Wheatstone Telegraph. Our bragging rights to other liveries is certainly that, “as we wore our 3D glasses Dr Brian May of Queen leapt out from the screen to ‘Greet the Worshipful Company of World Traders’”. Second? The World Traders Stand at the Red Cross Guildhall Fair was the second most successful stand of all 35 livery stalls, who in total raised £170,000. We must thank those who helped out on the stand driving up sales – Amanda Shackell, Corinne Larsen, Fiona Taylor, Gaye Duffy, Janet Martin, Jyoti Shah, Katy Thorpe, Martin White, Mary Hardy, Mavis Gold, Merlene Emersen, Michaela Lorenc-Suhrcke, Simon Spalding, and Vinay Gupta – and praise those who donated items so generously – Mary Hardy, Harprit Siri (Pitu) and Brian Somers. But the highest honour goes to Adèle Thorpe for pulling the entire event together. Third, our Bank of America Merrill Lynch event exceeded all expectations with 120 members and guests, quite a few of whom are enquiring about membership. • We hope to launch our report into The Economic Impact of Smart Ledgers on World Trade at the House of Commons on 17 April during the Commonwealth Heads of Government Meeting. And all with the support of Gaye. Don’t tell her, but I do have a few more surprises in store as you will all see, ranging from World Traders being recognised in next month’s City Debate to an article out today featuring our views in International Finance. And our trip to Dublin is fully subscribed with nearly 50 people coming to the Fair City. We also have a huge range of internal successes which will be shared at Common Hall, much revolving around the intense work of the Communications Committee led by Zoë Buckingham. Jim Davis once remarked that “Bagpipes are the lost connection between noise and music.” At the moment that might describe me, the lost connection between you and our distinguished Guest. 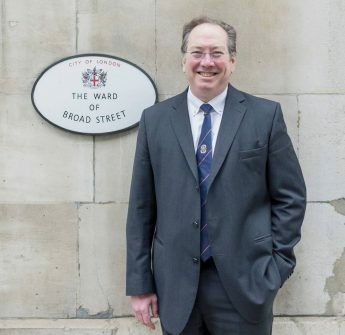 Perhaps most famous for being Editor of The Economist for 13 years, as a taste of his many positions he has been Chairman of the London Library and a Trustee of International Institute for Strategic Studies, and is currently Visiting Professor at Shujitsu University, a Visiting Fellow at the Blavatnik School of Government in Oxford, and a member of Tokyo University’s President’s Council. Bill’s Wake Up Foundation uses film, text, and data for public education and school courses about the decline of Western countries and what can be done to restore liberal democracy. Bill has kindly agreed to a question and answer session after his remarks. My sincere thanks to all of you for such a wonderful year so far, and now over to Bill.